Tom Vaughan from Worcestershire Archaeology Service said their location just outside the church's graveyard alters the history of the area. "We thought the graveyard boundary was static and had remained where it was since the church was first built but this clearly shows it was much larger," he said. "It indicates Kempsey was a lot more important than the smaller village we have now." He said it backed up evidence there was a Minster church in the area during the Anglo Saxon period and also a bishop's palace. 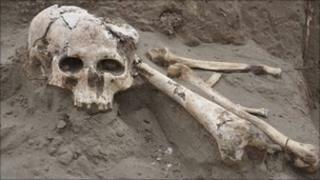 Archaeologists are hoping to excavate more than half of the graves with funding from the Environment Agency. Experts hope results from analysing the skeletons will reveal more about the people's quality of life, how they died, how old they were and if any of them were related. In 1954 two skeletons were found to the west of the church by archaeologists and at the time it was thought they dated back to the English Civil War. Mr Vaughan said: "Now it would appear they belonged to the medieval cemetery - it probably extends to a much wider area than we're currently digging in."